A new update for the official Twitter app hit Google Play today, full of new little features and fixes that greatly improve the app in the eyes of its developers. 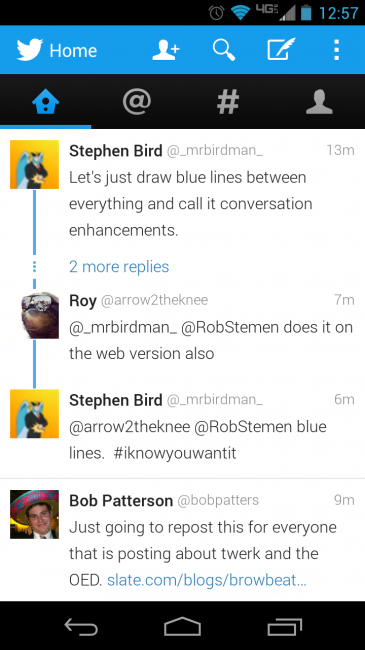 The big change you will see is a new “blue line” that connects conversations that are taking place in between people you follow. For example, in the photo we posted above, you can see two people I follow go back and forth about blue lines, and you know they are replying to each other thanks to the blue line. We wouldn’t’ say this feature was necessary, but it is what it is. In addition, the app has been optimized for “entry-level” devices, essentially becoming less intensive, allowing the weaker phones to handle the app. There are new notification settings, as well as the ability to report tweets as abusive or spam. To see the full changelog, check below.